Baserails with 41mm slots for stair spindles. Baserails are available in lengths of 2.4m, 3.6m and 4.2m, but can also be trimmed to size. Traditional stair parts in white oak. These Trademark range stair parts are made with natural wood and provide you with all the parts you need to create a stunning staircase or landing balustrade with a post to post handrail. Oak is a hard wearing premium timber that is a strong and heavy hardwood with a fine abstract grain pattern that gives it a superb finishing quality and a stunning natural appearance. The natural beauty of oak means that you can finish it with a choice of materials, such as wax, stain or varnish. These beautiful Trademark stair parts are designed to be mixed and matched to create a stunning landing or staircase balustrade that will match your individual specifications. These stair parts are designed to create post to post handrails that are straight and fixed to the newels to create a particularly strong and sturdy structure. 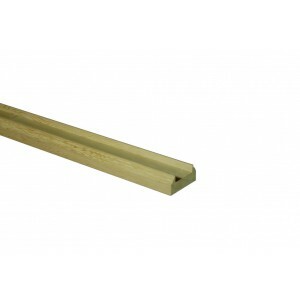 This range has a choice of spindle styles and newel caps that will add a decorative finish to any newel posts used.